In my last post, I explained what I have seen during the extended rollout of Panda 4.2. I ended up analyzing over seven weeks of Panda data, since P4.2 is going through an extended rollout. And yes, it’s still rolling out now. More about that soon. Overall, it had been very quiet leading up to that post. Sure, there were some sites that had seen impact and movement, but not like typical Panda updates. It was an underwhelming update to say the least. Well, something has changed and more significant tremors have been seen across the web. It’s hard to say if what I’ve been seeing is Panda or a tweak to Google’s core ranking algorithm, but September has been an extremely volatile month algorithm-wise. Specifically, there was movement on 9/2 with some sites seeing large drops in Google organic traffic. And then there was significant movement on 9/16 where some sites surged in traffic, while others dropped heavily. Now, Google pushes hundreds of updates per year, with over one thousand last year according to John Mueller. But the September tremors seem to impact sites with both Panda and Phantom baggage. I’ll cover more about that in this post, but to me it seems like the tremors we have seen are tied to content quality. And again, we have two quality cowboys in town now with Phantom (AKA The Quality Update) and Panda. I definitely saw some sites that got hit hard by Phantom jump during the 9/16 update. In this post I’ll cover more about what I’ve seen in September, what Googlers have said about Panda 4.2, I’ll explain more about the connection of these latest updates to Panda and Phantom, and I’ll touch on what I’m calling “The Methode Philosophy”, which is a possible change in how Google views Panda. Let’s jump in. Panda 4.2 started rolling out on 7/18/15 and we knew it would be an extended rollout that could take months. But nobody knew how long that extended rollout would last. Is it still rolling out, has it completed already, and how long before the update completes? All good questions that needed to be answered. Well, at SMX East Google’s Gary Illyes explained that Panda 4.2 is indeed still rolling out. He last checked on 9/30 and Panda 4.2 was still roaming the web. In addition, he said it will continue to roll out for the next few months. Yes, read that again. Panda 4.2 could have a six month rollout (or longer). As you can imagine, that’s a huge change from previous updates. Panda 4.2: Manually Pushed Or Auto-Rollout? Another question about Panda 4.2 revolves around how it’s being released. Was a giant red button pushed on 7/18 and then P4.2 began its long and extended rollout? Or is Google manually pushing Panda at intervals during the extended rollout. There’s an important distinction between the two. If Google is pushing the updates manually, then they can refine and tweak the algo based on what they are seeing in the SERPs (to ensure optimal results). That’s similar to what I saw with Panda 4.0 tremors, which was clarified by John Mueller. He said that after a large update, Google can and will tweak that algo to ensure everything is working they way they need it to. 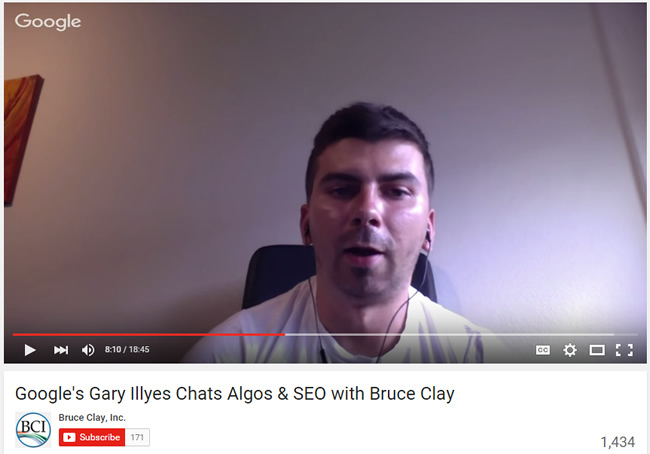 So I decided to ask Google’s Gary Illyes on Twitter. At first, Gary explained that Panda 4.2 was being manually pushed at various intervals. But that’s actually not correct. He misunderstood the tweet and didn’t mean that Panda was being pushed manually at various intervals. 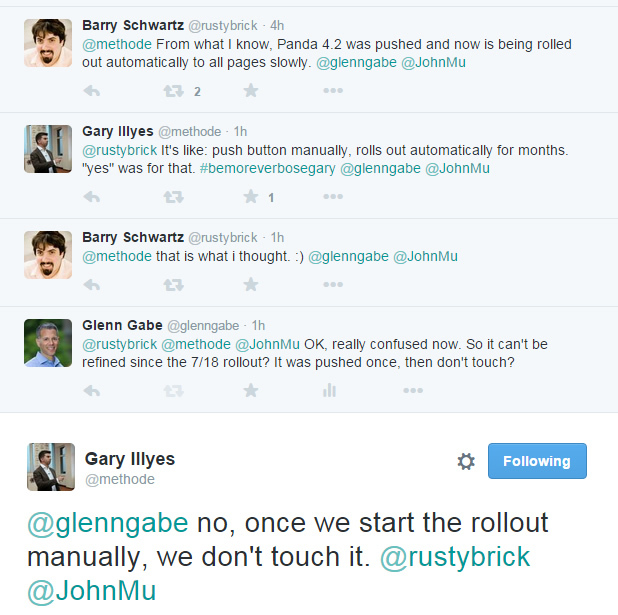 Instead, Gary explained that Panda 4.2 was manually pushed on 7/18/15 and then automatically rolls out over months. From what he said, there have been no refinements to Panda 4.2 since the initial rollout. That’s important to understand, since it can help us better understand what we are seeing now volatility-wise. And a big thank you to Barry Schwartz for questioning the original response. Without that, I think we would still think Panda 4.2 was being manually pushed. Both twitter conversations are below. First, here’s my question from yesterday. I’m sure you’re wondering what type of volatility I’ve seen in September and how that manifested itself in Google rankings and traffic. Below, I’ll provide some screenshots of what I’ve seen across websites, categories, and countries. I’ll focus on September 16 and highlight any connections I’ve seen with previous Panda and/or Phantom impact. When analyzing the drop in traffic across sites impacted by the 9/2 and 9/16 updates, I saw a number of familiar problems from a content quality standpoint. These are problems I’ve seen many times while helping companies with Panda and/or Phantom hits. Although some of the sites impacted had historical link problems, not all sites impacted had link issues. But they all had content quality problems. If you’ve read my previous posts about Panda or Phantom, then you know user happiness is extremely important. 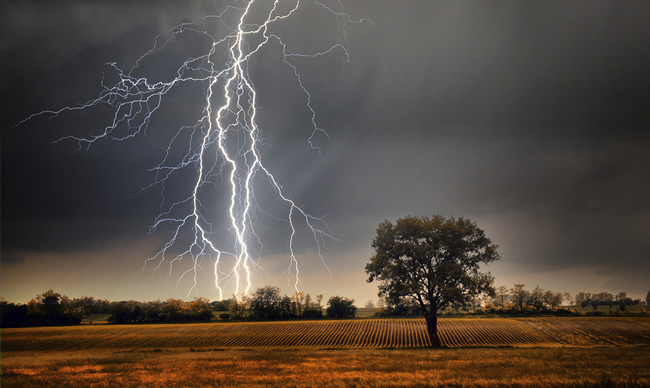 If you frustrate or anger users, then you can send them fleeing from your site. During my analysis of the September 2 and September 16 updates, I saw pages that dropped in rankings that provided horrible user experiences. For example, heavy ads scattered throughout the page, forced pagination (for monetization purposes), low quality supplemental content, and more. Let’s explore several of the problems below. Note, if you’ve been following Panda over the years, these problems should not surprise you. 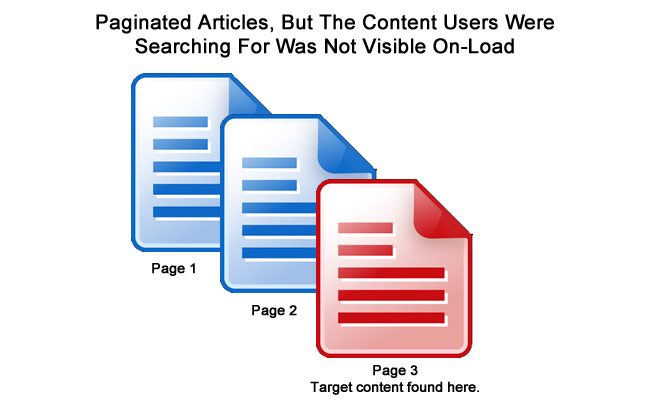 I saw several examples of pages that dropped out for keywords when those keywords were not visible on-load. For example, imagine searching for a topic, clicking a result in the search results, landing on a slideshow or paginated article, and not seeing the keywords or topic visible. This could result in a number of problems SEO-wise. The most important being users getting frustrated and jumping back to the search results since they can’t easily find the content they searched for. Remember, low dwell time is a giant invitation to Panda. Also, John Mueller has said many times that hidden content will either be heavily discounted or not indexed at all. So if one doesn’t get you, the other will. What’s interesting is that pages which used to rank highly for queries related to keywords searched for dropped during the 9/16 update. This was a strange one, and it somewhat relates to the bullet above. 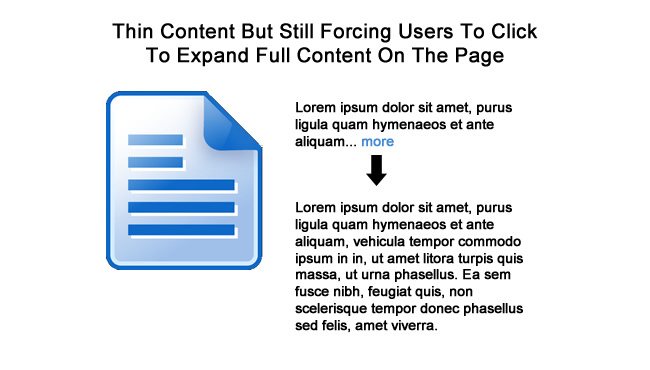 I found pages that were inherently thin (given the niche), yet the company still chose to force a user to trigger additional content (versus providing it on-load). I have no idea why they would do this on an already thin page, but they did. And I saw those pages drop. It’s worth noting several of those sites also saw drops during the Quality Update (Phantom) in early May of 2015. There were a few sites that saw substantial impact during the 9/16 update based on technical problems causing content and/or ad problems. 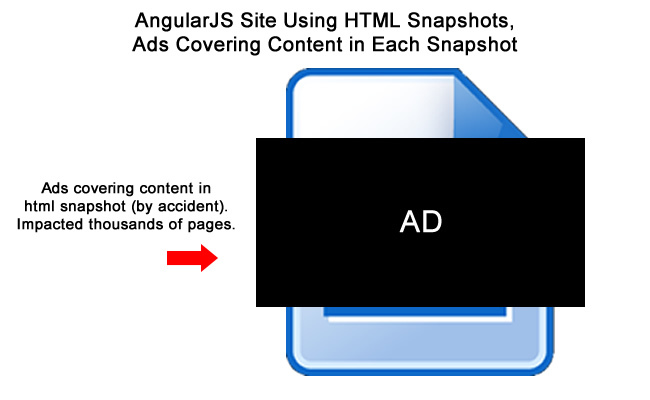 For example, one site built using AngularJS using html snapshots ended up having a giant ad plastered across its content (the snapshot that Google indexes). Thousands of pages were impacted. On 9/16 they lost approximately 40% of their Google organic search traffic. I can’t say 100% that the drop was due to the ad issue, but it sure looks that way. It’s a leading site in its niche with thorough and detailed content. Although I haven’t analyzed the entire site, having your html snapshots polluted by a giant ad is not good. Not good at all actually. 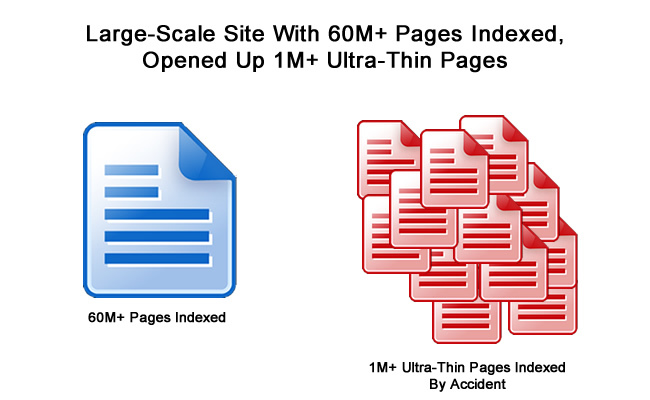 A large-scale website with 60M+ pages indexed ended up having over 1M ultra-thin, lower quality pages crawled and indexed (by accident). The business owner already nuked those pages, but they have been on the site for a while. This is also a site that typically sees movement with Panda updates based on its niche, size, and complexity. This is a solid example of “bamboo creep” that can occur without showing any major signs. Then boom, it catches up to you very quickly. I have to explain one jump I saw, since it shocked me at first. The site surged during the 9/16 update, so I dug into the increase in rankings and traffic. When I first visited the site, I almost fell out of my seat. 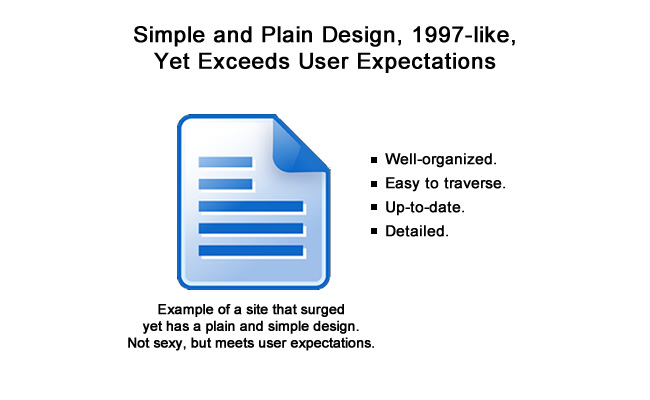 It was so simple, so plain, and so 1997-like, that I couldn’t believe the traffic numbers and strong rankings across competitive keywords. But I picked myself up off the ground and took some time going through the site. It didn’t take long to understand why this site ranked well. It provides granular details for a specific niche, it’s well-documented, and up-to-date. So I reviewed a number of important queries for the site and put myself in the shoes of someone searching for that information. And when I did, I was actually quite happy with the site. It was easy to find the information I wanted, it was organized well (even if it was extremely vanilla), and I found what I wanted quickly. Are Bi-Weekly Tremors The New “Quality” Release Schedule? So, we had an update on Wednesday 9/2 and then another exactly two weeks later on Wednesday 9/16. That sounds a little too perfect, doesn’t it? Based on what we’ve seen, does this mean that Google is tweaking Panda 4.2 and pushing smaller updates every two weeks? Gary says no, so it doesn’t seem like that would be Panda. But it could be Panda 4.2 continuing its rollout. It’s just interesting to see very little impact from P4.2 turn into serious turbulence in early September. And then exactly two weeks later, we saw more turbulence targeting content quality. That’s speculation, but the updates are similar to the “tremors” I saw after Panda 4.0 (as explained earlier). And by the way, if that bi-weekly schedule is remotely correct, then we should have another tremor any day now. I guess we’ll see. Before ending this post, I wanted to bring up an important point based on a video I watched with Google’s Gary Illyes. And I believe it’s a change in Panda philosophy by Google. Specifically, Gary explained that many wrongly believe Panda is about hurting or penalizing a website. He says it’s not. Instead, it’s about ensuring Google “adjusts” websites that become overly prominent for keywords that they shouldn’t rank for. Google wants its users to find the best content possible for the query at hand. So Panda is about making sure websites do not become overly prominent for keywords they shouldn’t rank for. You can watch him explain this in a Q&A with Bruce Clay (at 8:04 in the video). Now, I totally understand that, and I actually think it’s great. But that’s not how Panda worked in the past. It didn’t just demote pages on an impacted domain for keywords they shouldn’t rank for. Sure, that was part of it, but it crushed websites overall. For example, sites dropped by 60%+ overnight and it wasn’t just overly generic keywords that site shouldn’t rank for. It included core keywords that the site should rank for. That’s why many viewed Panda as an algorithmic penalty. The reason I bring this up is because Gary’s comments lead me to think that Panda could have changed… and maybe that’s why we are seeing different results from 4.2 than we typically see. Panda 4.2 is supposed to be a refresh. But what if it’s something different? What if it now works based on how Gary explained it? Again, I like the approach and I think most SEOs would be on board. But I’m concerned for websites that were hit by Panda 4.1 on September 23, 2014 or by the October 24, 2014 update. Many of those websites are still struggling to recover, even after making significant changes. And if Panda has fundamentally changed, then those sites may never recover. They would be in Panda limbo with little hope of coming back, and that would be wrong. It’s hard to say if this is happening, but it’s worth noting. That said, I’m actually hopeful given the volatile September we just experienced. Frequent updates can be good, as more sites can see impact (and hopefully up with the down). Let’s face it, would you rather have 10 months of inactivity or frequent updates? I’m for the latter. Moving forward, it’s always smart to clean up any problems your site has (both on-site and off-site). This is the same advice I’ve been giving since before Panda 4.2 rolled out and I still believe tackling all quality problems is a smart way to proceed. In a nutshell, you should be ready for more tremors, for Panda 4.3 (if that’s coming), or for the real-time Panda (which we know Google wants to roll out).